Despite the drought taking its toll across parts of Queensland and NSW, some growers had reason to celebrate when the winners of this year’s Sydney Royal District Exhibits’ Competition were announced recently. The annual Easter Show event sees industry participants from five agricultural districts source grain, fruit and vegetables from local competitions and leading farmers within their areas to compete in Sydney. Produce from the Southern, Northern, Western, Central NSW and South East Queensland districts is then used to build giant displays for the exhibit, which showcase the excellence of their regional produce. In the grains section of the competition, growers from places like Condamine Plains in the north to Tomingley in the south managed to churn out healthy crop samples this year despite the tough conditions. 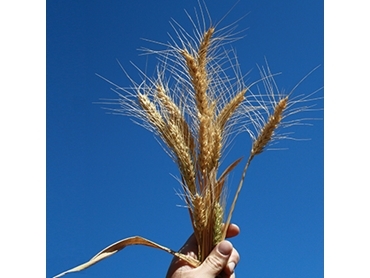 In the wheat categories, judges put grain density, protein, uniformity and condition under the microscope. The Champion Prime Hard Wheat title was won by Morella Partnership, Bungunya, with an entry ofSpitfire that scored 96 points out of 100. Their entry also won the Hugh Ross Memorial Perpetual Trophy for Champion Wheat of Show – the second year running for the partnership. Reserve Champion Prime Hard Wheat was also won by Spitfire, this time from Leverton Pastoral Co., Bogamildi, Moree, on 95pts. Champion Hard Wheat was scooped by G Dunlop, Moree for their Kidman wheat on 89pts, while Reserve Champion went to Goondiwindi farmers P & M Jackson for their Wylie entry, which accrued 88pts. Champion Soft Wheat went to B & C Unger, Harts Cottage, Tomingley, with an 90pt entry of Impala, and the Reserve Champion also went to an Impala grower; Andrew Craig, Werlito, Mullaley, 89pts. Spitfire is a new APH variety out of the LongReach Plant Breeding program, while Impala is also a product of LRPB. For sorghum grain, judges were again on the lookout for grain density, protein, uniformity and condition. Champion Sorghum Grain was presented to Condamine Plains Company (formerly Bligh Family Trust) from Brookstead for their crop of MR-Scorpio on 94.5pts and the Reserve Champion was Tudgey Farms, Newhaven, Werris Creek for their MR-Buster on 94.1pts. In the sorghum heads section, points were awarded for weight of head, uniformity and condition. Champion Sorghum Heads was won by BM Pepper, Roslyn, Breeza, for their entry of Pacific MR43 on 94.5pts and Reserve Champion was taken out by Tudgey Farms, Newhaven, Werris Creek, for their MR-Buster on 93.3pts. In the maize cob section, judges put trueness, uniformity and condition to the test. The Champion Maize Cob was presented to J O’Brien from Naranga for a 92.4pt entry of Silvermine, while the Reserve Champion award was won by Steven Osborne of East Maitland for his PAC 727 on 91.8pts.